This year, one of our program goals was: Fifty percent of ninth through eleventh grade students will visit a career fair display of their number one identified career cluster. Setting this as one of our three measurable program goals at the start of the school year really held us to finishing it out in the spring. First, we put it in writing in our Annual Agreements in September. Then, we posted it where we would see it during our weekly department meetings. 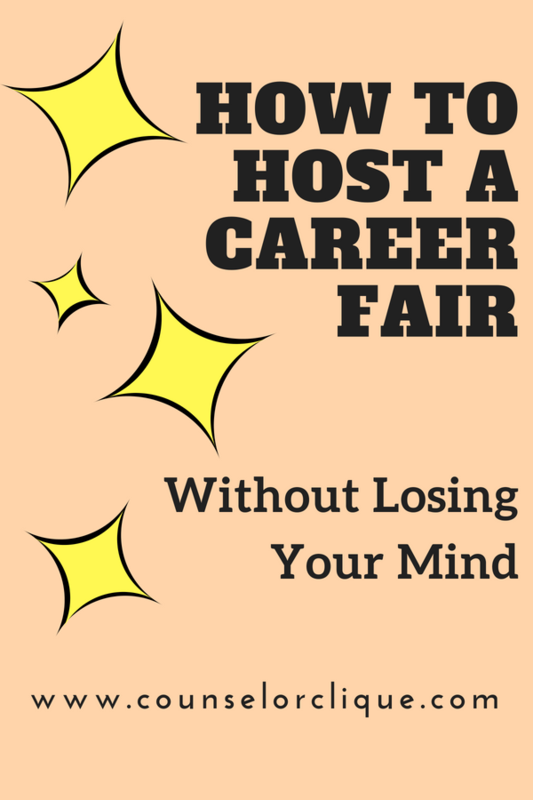 Warning: A career fair is NOT for the faint of heart. There are a lot of moving pieces and a lot of details, but it's worth it! The title of this blog may be a little misleading... because there may have been a few times I thought I lost my mind... but read on for a lengthy post. 1- Get it on the calendar. I've found that I can always make excuses until it's on my calendar, and I've told people about it to hold myself accountable. We did ours in April, so we started the advertising a few weeks before. Do you use social media? Get it on Instagram and Twitter. Do you have a digital media class at your school or a student you know who is good at making videos? We had a student make us a video advertisement that played in the cafeteria, the school website, and school Facebook page. Make a bulletin board for it ("Get the Scoop on Careers!"). I swear half of our job is information management. If you forget to get it on the calendar and get the word out, your event will NOT be successful. 2- Start a spreadsheet of contacts. We started with our state's 16 career clusters to give us a framework for categories to pursue careers in. We started with people we knew. Our spouses, our neighbors, our students' parents, people we interact with and have some relational capital to make the ask. We extended our network feelers outward. Checked our LinkedIn pages, scrolled through our phones, thought about our school system and PTSA connections. Our list grew, and eventually we got at least one contact in each category. We finished with 35 business partners on our line up. We sent emails inviting these business partners to our event, asked for initial confirmation, and then we followed up with a reminder email and details closer to the event. 3- Figure out your school's logistics. We did our career fair at lunch to minimize classroom interruptions. (If we did it again, we'd invite teachers to bring their whole classes through if they wanted to have that option.) Our gym is right next to our cafeteria. On top of advertising, we had a speaker and a microphone set up in the cafeteria. Our emcee (fine- it was me :) ) enticed students to get up during their lunch and take a walk through the career fair. 4- Have a system. As students went through and talked to business partners at their tables. One counselor stood at the entrance door handing out half sheets of card stock. On one side, we made a map of what tables were where in the gym. (The path circled from one doorway around the gym making a path to the exit.) On the other side of the card stock, we had a lot of questions that students could ask the employers about what they do. (You can see the Career Day Conversatin Card here.) Of course students can ask their own questions, but this was a great starting point for students to engage in conversation if they didn't know what to ask or say. Each table had a sign labeling who they were. I made these on Power Point making a template and dropping in names. 5- Involve free food. This goes for your business partners and your students. Since we asked our business partners to be set up from about 11:30-2:30, we ordered boxed lunches delivered to our school to let them eat during one of the breaks. We had cold waters in a cooler for them, too. Many commented that they loved this. Someone donated some extra funds to our school that hadn't been allocated yet... so our principal let us buy little ice cream cups! THAT was our strategy. Kids follow the food (let's be real-- I do, too). In order to GET the free food, however, you know there was a catch. Students had to get their cards stamped by at least 3 business partners (we gave our table hosts cheapy stamps before the event started). Students had to show their card to a counselor, drop it in the bucket, then claim their ice cream. We counted these cards by hand at the end, and this is how we determined 631 students came through our doors. (Most of our seniors have an early dismissal and don't stay through lunch-- that's why our goal targeted 9-11th graders.) 631 cards out of 1307 possible ninth through eleventh grade students meant 48 percent of 9th through 11th graders came through our first annual career fair! Though our goal was 50%, we really felt like the entire event was a HUGE win. We heard students and teachers buzzing about it for a week after! It was a LOT of work, but we felt so accomplished afterwards. A real test of a student-centered school counseling program! 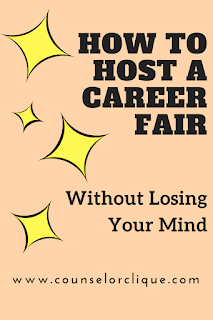 **Grab the Career Fair Conversation Card and the Career Self Efficacy Pre/Post Test to give yourself some practical tools to hit the ground running.